Happy Muffin Tin Monday! This is one of my favorite muffin tin meals ever. I think this was from 2011. It's not much to look at. But the raisin bread dipped in the vanilla yogurt? Pure Awesomeness. 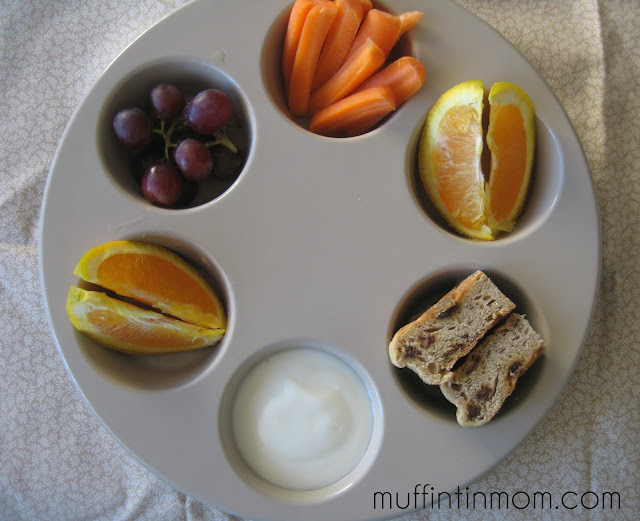 In this muffin tin breakfast for kids: cinnamon raisin bread, vanilla yogurt, orange slices, red grapes and carrot sticks. Now it's your turn! What did you make for Muffin Tin Monday?Share your photo by clicking the "add your link" button below! I would totally eat this for breakfast. I found you through Pinterest, and I think your website is absolutely adorable and so unique! Great idea to do the muffin tin thing! Love it! I featured your adorable candy corn candle on my site, www.iPinnedIt.com, which showcases FLOPS! and PROPS! off of Pinterest. Your idea is definitely a PROP! So, so darling!